Place the chicken breasts in a large shallow pot. Cover them with the chicken broth, adding water if necessary to make sure the chicken breasts are covered by at least 1/2-inch of liquid. Add the carrot and one of the onions (peeled and halved) as well as the bay leaves. Bring liquid to a gentle simmer, and cook for 15 to 20 minutes, or until chicken is just cooked through (barely pink in the middle of the thickest part). It's necessary to cut into the chicken to tell when it is done. If some of the breasts cook more quickly, you can remove them earlier. Set chicken aside to cool, and strain the broth. Reserve broth. Shred the chicken into very small pieces. We use a food processor fitted with the plastic blade for this step, but you can also use your fingers or forks. Stir the softened cream cheese and lime juice into the shredded chicken. Finely chop the second onion and the garlic. Sauté the onion and garlic in 2 tablespoons of butter until golden and soft. Add the hot onions and garlic to the chicken mixture and stir until everything is well mixed. Measure the chicken broth (you will probably have about 3 1/2 cups). If you have less than three cups, add more canned chicken broth to make 3 cups. Bring the chicken broth to a boil in a saucepan, and gradually stir in the same amount of flour as you have broth (so if you have 3 1/2 cups broth, add 3 1/2 cups flour). Stir vigorously and cook for 2 to 3 minutes. The mixture will become a stiff dough. Remove from heat and chill in the refrigerator for 1 hour. At this point, you can chill the chicken mixture and the dough for several hours or overnight. 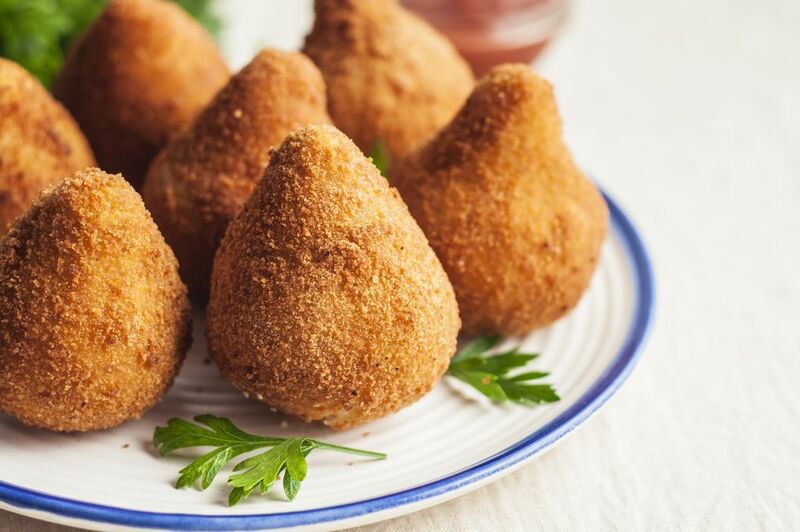 To shape the coxinhas, take a piece of the dough, about the size of a golf ball, with floured hands. Roll it into a ball, then hollow out the middle for the filling. Press a golfball-sized (about 1 1/2 tablespoons) piece of the chicken filling inside the ball of dough, and press the dough closed around the filling. Shape into an approximate drumstick shape, flouring hands as necessary. Stand the coxinhas on a baking sheet, so that the pointed end sticks upwards. Continue until you run out of dough or filling. Whisk the eggs together in a bowl. Place the bread crumbs in a shallow pan (like a cake pan) and season with salt and pepper. Dip the coxinhas in the egg, then in the breadcrumbs to coat. Chill the breaded coxinhas for 1 hour. Fill a heavy-bottomed pot with enough oil to cover the coxinhas. Heat the oil to 360 F. Fry the coxinhas in batches until deep golden brown. This dish is best if you start them the day before you fry them. If you're lucky enough to find Brazilian catupiry cheese, use it in place of the cream cheese.